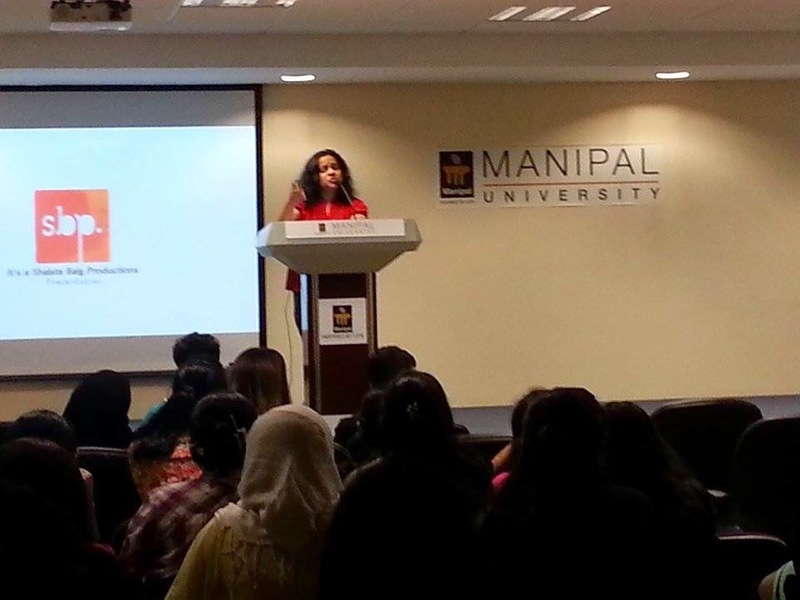 Indian Independent Filmmaker, Sonia Filinto was invited to screen her documentary Shifting Sands (2013) at the Manipal University Dubai Campus on 16th October, followed by an intense Q&A session that discussed the film and its components as well the hardships of independent film making and challenges for young filmmakers. Sonia Filinto is a director, producer and actress who has been a resident in Dubai for seven years. She has worked on several films, including Sau Jhooth Ek Sach in 2004 as an actress; Colours Black in 2001 as associate director; and 100 percent, a movie directed by Mamta Murthy. The 30-minute documentary Shifting Sands (2013) explores the life of the fishing community in Calangute, a popular tourist village in Goa, India. The lure of fish appeals to locals and visitors alike but is the lure of fishing still a draw? The film aims to give voice to fishermen as they discuss - how they perceive themselves, their trade and the constantly changing life around them.' The film has been screened in Goa, London, Dubai, Abu Dhabi, at the Festival de Cannes in the short film segment, and will be screened in Bangalore in a few days. Rinaazuddin Khan, Aaron Miranda, Lippy Ramchandani, Aadi Nair, SayemaWasi, AnkurNarula, Ahmed Mir, Mark George, Fatima Rahman, Sheanna Murray and Sheldon Rodrigues. 24 fps initiated the first year students to the clubs activities and were asked to present themselves and their favorite film genre/titles. 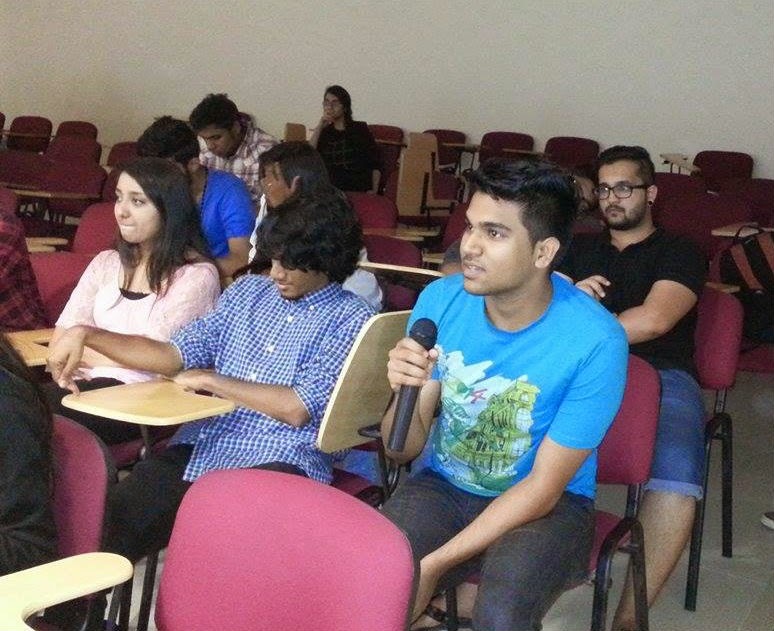 The screening was organized by 24 fps, under the guidance of faculty members – Mr. Sabir Haque and Ms. Megna Kalvani. President of the club, Hansa Luximan, coordinated with the guests and arranged the proceedings of the event. Why a documentary on fishing? I realized that I didn't know much about them, apart from the obvious. And that’s when I started going to them, to get the story from their point of view. Why did you create this documentary, to raise awareness? Everyone wants fish, everyone talks about fish in Goa, it’s a topic of discussion. But about the fishing community, I personally didn't know too much myself and therefore I just wanted to raise awareness and more than that, learn about them and their lives and share it with others, what I was beginning to learn. Was it easy to get the fishermen to open up to you, were they eager to discuss their stories with you? By large, yes. If needed, I would go and spend some time with them and talk to them, initially when I had to do research. And the more I spoke to them, there was that comfort factor but I had to go and spend time with them. I had to make them feel comfortable and then take the camera. How long did it take to shoot this entire documentary? Making the film took me about a year because it was a film that I made myself, in the sense that it wasn't funded or it wasn't part of any larger project. So in my free time, I put together a cameraman, a sound recordist and went and filmed it. Post-production is the thing that took the longest, because we were editing at the end of our day job. So sitting with an editor after their day job, and you know how editors are, they don’t have day and night jobs. So it was a few hours every day and it was a long process mainly because it was something that was made after office hours. Did you have to go back for the seasons? Yes, because for the monsoons they don’t go out fishing, we shot twice, once in October and a little later. So I definitely had to keep that in mind, as in the monsoons they don’t, though one of them said ‘we do go out during the monsoons, because if you get a catch, you get good money for it’. For a documentary movie, do you have a script? Because I did research as a documentary filmmaker, research is my keystone as to how I’m going to shoot and for a story, but not as a bound script as such as you would do for fiction, but definitely how you would structure it and what you want to ask as questions. And of course it evolves because when you go film and that’s the beauty of a documentary and also the challenge, because you go there and you get something else, which you probably didn't expect. And that did happen during the shoot and some things came up and we jig the script after the shoot. It’s a good practice because you know what you’re going with and when it changes, it doesn't overwhelm you because you have a script and say ’okay this is changed, this is not changed’ and keeps it more under control, even with the changes. So you ask the questions and they have no idea about the questions? Do you talk to them beforehand? I did but I didn't say ‘I’m going to ask you this and talk about this’ I would just ask them when they’re talking about their life, their background, their family, so it was basically chatting with them initially, like with the woman who was grinding, she was actually initially not part of the plan to shoot. But I went and he was not there so I got talking to her and I realized she’s fantastic, she was very outspoken, she could talk, she was very comfortable in front of the camera, so I said okay, we need to film with her. What kind of problems did you come across while shooting the documentary? More than actually filming, it was a challenge because, like I said, it wasn't something part of a larger project, so definitely, putting it together. That was the biggest challenge because it was something that I wanted to do at the end of my day job, that was the challenge. You just have to be persistent. For example, I wanted to do the music professionally and work on sound professionally. I put together a bit of the edited and went to some studio and I was fortunate as they said ‘okay fine, we’ll do that’ and again, they would do that only when they had free time so I was on call, you never know when they’ll call and say ‘okay we have free time can you come in one hour’ so you just drop everything and kinda rush since they have the time. It did get very frustrating in between, I kept asking ‘oh God is this ever going to end?’, I wanted to complete this. I guess patience pays eventually. That was it, but in terms of the filming, I was fortunate because of the language. By large, people weren't very resistant. I would start talking to them, and the talking helped. Talking to people initially, not just putting the camera on their faces. Definitely, talking played a big role in making it easy, when I had to film. It’s not a question but I would like to express what I felt after watching your movie. We live in a world where classes are defined and respect is earned. Happiness is success, it defines your class, it does not make you regret, not even a bit. The fishermen for instance seem satisfied and they don’t care about proving anything to anyone. They live their life with so much of positivity. Thank you for your observations. Definitely, I used to think earlier that they don’t want to do fishing, they’re not interested. But they are very interested. They want to do that. Okay, a lot of things that happened to them are out of their control and they cannot, but specially the older generation, they could drop anything and just do it. The youngsters, yes, and no, you could say. It’s hard work, it’s manual labor so probably not everyone wants to do that, but definitely a much much larger percentage than what I initially thought, one would normally just write them off. But definitely, there’s a lot of desire to do that. There was a fisherman in your video that said the children needed to […] and actually swim. So I wanted to know, was it because he wanted more hands to work or to keep the tradition alive? I think it was more because of more hands to work, because that was their trade, like ‘where’s education supposed to take us?’ and that was the thought. He makes a statement about the class in that sense. He said ‘we were not the land owners and the land owners were cultivating coconut trees and coconuts. For us, it was just about going and fishing so why did they need to go to school? That was their way of thinking and he does later on say, well does not say but there’s that subtext, now tables have turned, fish’s value, earlier there was no value, so for him it was going with the trade and it was more important, at the same time he’s summing up the entire social, I wouldn't say divide, more like disparity. It was a bit of a look down. I don’t know if you've experienced it, certain trades and professions in society are a little looked down. Your documentary was really good. As for me, it was fantastic. I thank you for bringing out all the Goan fishermen and what they thought. Could you tell us about your travels, and how traveling is important to a filmmaker? There’s travel and there’s travel. In the sense, whenever you go to a new place, there’s nothing wrong with going to a typical holiday destination. But it’s about going and experiencing the place. You do that by talking to the people. Whenever you get a chance, wherever you go, just talk to the locals, try and go meet the people, just have a chat. If you go to a store just to buy chewing gum, for example, and try to go to a local store as opposed to a supermarket just to pick up something and have a chat with them. You don’t know, it’s very interesting the things that come up. Spend some time in that, apart from doing whatever you have set to do. Definitely spend some time in talking to the locals, there’s no substitute for that in terms of knowing about the place and different viewpoints and the more you talk to people, the more you learn how to read what people say and that as a documentary film maker, the interviews that you do, you always have to keep your eyes open for subtext, for reading between the lines for what the person is saying and what the person is not saying, because what the person is not saying is also a telling statement, yeah? So talking to people is a good exercise, I would say. Don’t look at it as an exercise, just as a chat, chatting with someone. But what they say and how you converse, that goes a long say in whatever subject you choose to make a documentary or whenever you’re researching, it’s been my personal experience, just talking to the people. Keep your eyes and ears open for stories, because you don’t know where your stories come from, somebody talking, a small little blur that you […], away from the big headlines. Observe life, I know it sounds grands, but it’s actually not. It’s about observing things around you. That’s where you get your stories, that’s where you get your ideas, your thoughts, interactions with people, keeping your eyes and ears open, that’s the most basic advice. In terms of making your film, watch as many films as you can. Everyone has access to YouTube, Vimeo. Just watch something good, a good film and even something you think ‘oh this is such a bad documentary’, try and look why it’s a bad documentary, because you’re no longer a passive audience, you’re students of media, and you’re practitioners, soon to be professionals. The way you look at things is going to be different from the way probably a common man or woman on the street does. So train yourselves to read the film well. Because the more you understand what a good film or a bad film is, the better you can make films. So keep watching, there’s no substitute, just watch. And understand what is there apart from the obvious message, obvious visuals. These are the two things I would say. I think they’re key to make good filmmakers.